Horses have a natural distaste for moving backward because they don’t like to step into area they cannot see. You may notice this if, when dismounted, you try to make a horse step backward. The animal’s initial reaction will often be to raise its head and plant its hind feet firmly in objection. When mounted, if you simply pull on the reins to make your horse back up, you probably will get the same reaction of head raised and feet stuck. To overcome this problem, you must think of backing as another aspect of the impulsion you have been creating in all of your forward work. The only difference is that the impulsion is now being channeled in the opposite direction. To prepare to back, take a steady hold on a short rein. Then applying leg pressure to press the horse into the bit, keep a firm feel on the reins so that the horse cannot take even a single step forward. Motivated by your leg, but unable to escape forward, the horse will attempt the backward route, at which moment you should ease the pressure of your legs (and hands, if possible) to reward the horse. From that point on, use only enough leg and hand pressure to continue the backward movement for the required number of steps in a steady tempo. When backing is not followed by another test, you must count the number of steps the horse takes going backward and be sure it walks forward the same number of steps to resume its starting position. 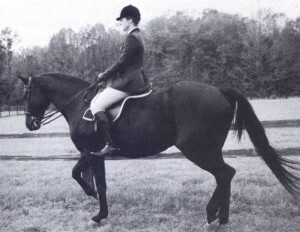 When backing is used within a series of tests–for example, “Jump fences 1, 2, and 3, halt, back four steps, trot fence 4, and exit the arena at a sitting trot”–the horse is not required to take the same number of forward as backward steps, but instead assumes the next gait immediately after the backward steps. The horse is backing correctly, stepping in diagonal pairs, staying straight throughout the body, and maintaining a round frame and calm demeanor. A good hunter should take long, low steps across the ground (sometimes called “daisy cutting”) and cover about twelve feet per stride on course. When it jumps, its knees should be held high while its fetlock joints are folded tightly. Its topline should be round in the air so that its haunches are counterbalanced by an outstretched head and neck. Most importantly, the horse should be calm, giving the impression that it is both safe and sane. In choosing a horse, your first consideration should be the horse’s temperament, then its jumping ability, and finally its way of moving. No matter how athletic or physically attractive a horse is, if it rushes around a course looking wild-eyed, it won’t win any ribbons in hunter classes at a decent show. 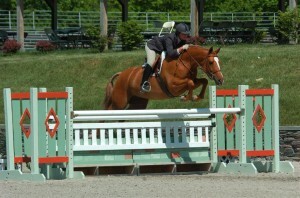 This horse exhibits good jumping form, with a round topline and evenly-folded legs held high.